Jaipur Sangeet Maha Vidyalaya is a finest music and dance training institute where thousands of students of different age group have been trained. The word Kathak is actually derived from the Sanskrit word Katha which means story and Kathakarwhich means storyteller. That is what we train our Kathak dance aspirants. We teach it from understanding the original purpose of the dance form. Our intention is not only to equip the style but also to shape the aspirants for Kathak. Our job is to make the aspirants fall in love with the dance style so that they get deeper into it and manifest the art without any blemishes. 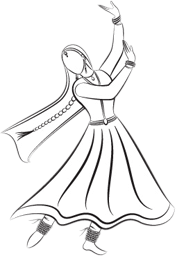 JSMV Kathak class includes both pure dance and demonstration through expression. If you think why you choose our institute for Kathak Dance learning, we just want you to clarify that we are one of the pioneers in Jaipur and we are a comprehensive institute to turn any interested aspirant into an expert artiste. Our qualified and trained teachers have been practicing and specialized in the individual art form for many years. We not only provide usual class sessions but also opportunity to showcase the skills of the aspirants. We also organize workshops that invites prominent artists in the respective fields. Jaipur Sangeet Maha Vidyalaya always takes pleasure in opening avenues for the aspirants to perform with celebrities. Facilities we provide, support given by the faculties, positive ambiance, and most importantly treating everyone equally will be advantageous for every students who step in here. If you are eagerly hunting for Kathak Dance Classes in Jaipur, we welcome you to the one of the great institute to transform your talents.